Summer has arrived. The air is hot, dry and dusty. The trees are still green, the ground is turning yellow and brown, and the vegetation is drying. A eucalyptus haze hangs over the mountain. You can smell the trees. 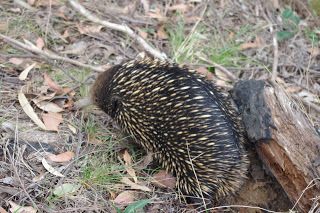 Grass now crunches beneath my feet and bidgee widgee burrs stick to my shoes (also Sir Scruffy). The drone of insects buzzing around flowers evokes memories of hot summer days as the birds are wisely quiet during the heat of the afternoon. When the heat is intense enough the cicadas sing their summer song in the mid-afternoon slump. Unfortunately, it isn’t all just lazing around on long hot summer afternoons. 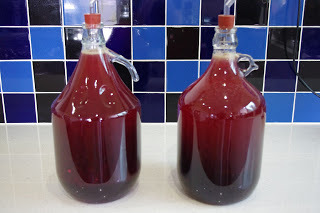 Those lazy afternoons are the perfect time to begin the continuing process of preserving the summer goodies so that in the depths of winter a person (me) can enjoy a brief recollection of those long lazy summer afternoons. 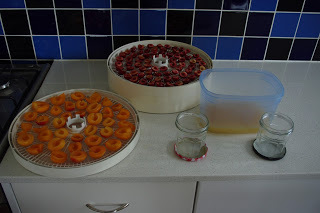 This week was my first foray into the world of preservation of fruit by the process of dehydration. 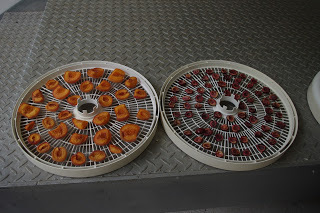 I recently purchased a second hand Fowlers Vacola (Ultimate 4000 dehydrator) electric food dehydrator and am today using it for the very first time here preserving apricots and cherries. The entire drying process can take between 10 and 16 hours and it is a great use of solar electricity that would otherwise have gone to waste. 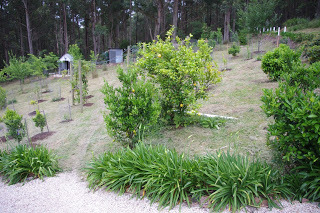 I have previously wondered why lemon trees were so popular in old gardens down under. 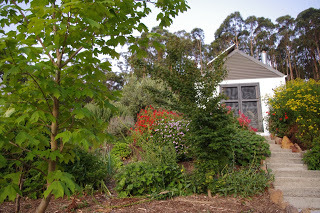 In the older inner urban areas of Melbourne, it seems as if every single household used to have a century old lemon tree which produced huge quantities of fruit every single year – without a care or thought by the owners of the property. As a child, I can distinctly recall the feel and smell of climbing in the very old lemon tree that my Grandmother had. In more recent years however, no one seemed to ever know what to do with the lemons. Over the past year or so I started having to contend with the realities of what to do with several hundred lemons per year from the fruit trees here. And the answer finally popped into my head this morning. Lemons provide a cheap and easily available form of citric acid which was traditionally used for preserving. If you are making jam – you can use lemons to provide the acid which assists with the preserving process. Most other preserving processes use lemons to provide enough acid to ensure that nasty bugs don’t make you sick later on or that the preserve spoils (or even dares change colour!). Plus don’t forget the many varieties of wines, all of which require lemon. I’ll tell ya what, I can’t get enough of them lemons and look forward to the day when all of the trees are producing strongly. Go the lemon! So, I had to squeeze the juice from about 20 lemons this morning in order to get enough lemon juice, which you may recall is absolutely full of citric acid, for part of the dehydrating process. The apricot halves which I was about to dehydrate had to be immersed in that squeezed lemon juice for about 5 minutes as part of the dehydration process. I also halved an additional two dehydrating trays full of cherries and they are also now in the dehydrator happily dehydrating away. What was interesting was that the instructions (which are from a local supplier) stated that the cherries did not have to be immersed in the lemon juice, and were OK to use as is. Perhaps you could assume from the instructions that the cherries have a high enough acid content? The fruit halves are then placed on the dehydrator trays and the lemon juice is bottled up in glass jars and chucked in the freezer for later use (hmmm, more lemon wine?). 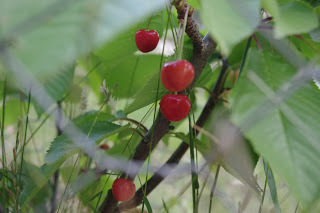 I tasted one of the cherries after almost six hours of dehydrating and I can say that it tastes good – but the process still has a long way to go yet. The bees have been enjoying the lazy hot summer afternoons and they are very active and making quite a lot of noise in amongst the flowers. The drone can be almost deafening by the afternoon. Poopy the Pomeranian (who by now, we all know is technically a Swedish Lapphund) wins the prize for enjoying lazy hot summer afternoons the least due to the sheer thickness of his double coat which is possibly more suited to Swedish summers than a down under heat wave. Fortunately for Poopy, he had a haircut in the past few days. The haircut had been booked in months ago and it was lucky for him that was the case as he would have struggled with the early heat wave even more than he did. Poopy was a little devil to take a photo of this morning as he refused to sit still and co-operate for the camera. 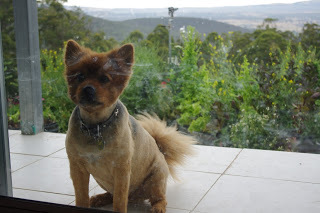 Now that Poopy is much cooler due to the recent haircut, he is far more active than previously, and in the end I simply kicked him outside into the early morning heat (it was about 25’C 77’F at 7.30am this morning) and took the photo through the glass door. That glass door by the way has 10mm (0.39 inch) toughened glass and he knows he has no chance whatsoever of getting back into the house unless he quietly sits down whilst I took that photo. Take that Poopy! It may be hot and dry here, but compared to the surrounding country this mountain range is a paradise. There is a permanent source of safe and clean water for the many birds to drink and wash themselves in here. What this means is that every few days I’m spotting new bird species at the farm. 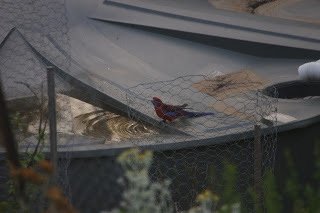 Yesterday for only the second time that I can recall, I spotted a falcon attacking several galahs and so I had to carefully supervise the chickens whilst they were free ranging out in the orchard during that early evening. Even the King Parrot brought a friend up to visit the farm yesterday so now there are two of them. 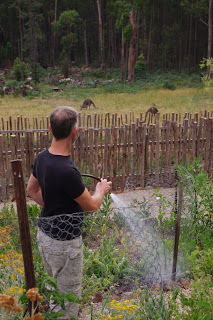 The local wildlife – whether it be marsupials or even foxes – get to enjoy the permanent water that I leave out for them too. 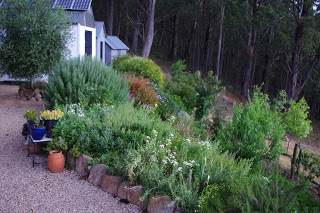 A couple of nights back, the editor spotted three wombats and (this is no exaggeration) fifteen wallabies in the orchard below the house. 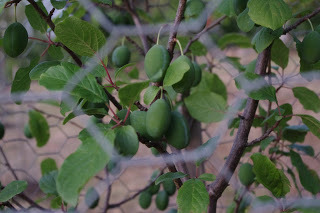 I’m a little bit fearful for the safety of the fruit trees this summer season! I spotted this wallaby appreciating the many and varied (and also yummy!) flowers in the garden below the house yesterday. 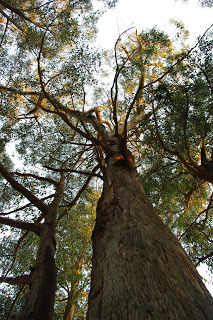 Honestly, that tree is so large that it is possibly on the heritage register for large and significant exotic trees! 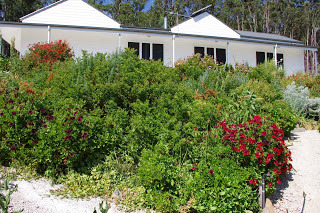 It is planted in the garden of the one-time Governor Generals summer retreat which is coincidentally opposite the local pub. A few regular commenters have requested details about the type and quantity of flowers here for the bees and I may produce a separate video on that subject over the next few weeks. 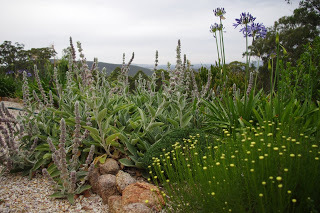 In the meantime, the lambs tongues, various herbs and agapanthus have commenced flowering this week and will provide lots of bee food in the immediate future. A small amount of rain is predicted for this evening and tomorrow, so I have continued planting out the many spare tomato seedlings and hopefully they will survive the summer and produce fruit? 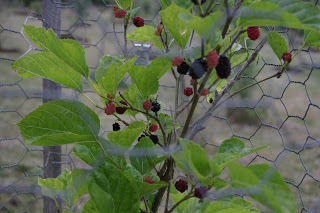 Mulberries are a delicious fruit that you will probably never see for sale. Yum! The temperature outside today reached over 33’C (91.4’F) but the temperature has turned cooler now with a possible storm approaching and at about 6.45pm has fallen to 21.1’C degrees Celsius (70’F). So far this year there has been 694.0mm (27.3 inches) of rainfall which is up from last week’s total 689.4mm (27.1 inches). It is a tough first day at school, when your parents decide to kick you out of the nest and out into the big bad world. That first day is even harder when the midday sun burns intensely, the insects roar, the grass crunches beneath your feet and the day just feels overly hot and long. That is one tough first day at school for anyone. The Kookaburra’s had been constantly calling to one another as they flitted in and out of the shade of the tall trees on that hot summers day. It is always wise to listen to the unmistakable call of the Kookaburra’s as they warn each other of predators and other unpleasant events that may otherwise go unnoticed by myself at Fernglade Farm. However, on that particular day I reckon the calls were warning each other that my canine friends and I were working hard in the hot mid-afternoon summer sun in the orchard. Initially, I believed that the Kookaburra’s were calling to each other to let them know that a snake was weaving its way through the grass. With that warning in mind and given the real risk of snake bite, I decided to stop work in the orchard and take a good look around. My canine friends were quickly relocated into the confines of the house for the rest of the day, which allowed for a slightly safer examination of the very young Kookaburra on its first day at school here. I was mildly concerned for that young bird’s safety, especially given that two really small and very cute fox cubs freely roam the farm here at night. 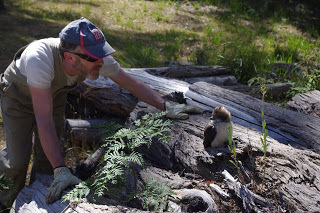 My first interaction with the young Kookaburra was to ensure that it knew how to fly. And I’m pleased to report that the young bird knew how to fly – for short distances anyway – on its first day at school. As the afternoon progressed, the parents of the young Kookaburra swooped down and joined the young bird only to fly off again. They were clearly demonstrating to the young rapscallion how to go about conducting oneself as a mobile member of their species. As the hot summer afternoon wore on, the young Kookaburra steeled itself to ever greater efforts at flight until eventually it disappeared with its parents into the surrounding forest. 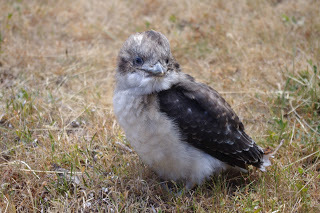 May that young Kookaburra enjoy many tasty grubs, insects, and snakes at the farm here for many decades to come. As this summer becomes ever hotter, more birds, animals and insects call this farm home as they turn up for the reliable feed and access to fresh drinking and bathing water. I am constantly amazed by the ever expanding variety of different species here and this week was no exception. 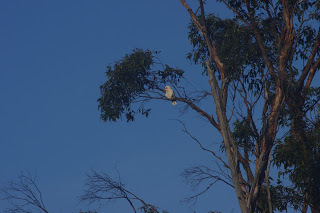 A breeding pair of Long Billed Corella’s have been basking each day high up in the very tallest of the trees here taking in the first few rays of the early morning sun. The long-billed Corella (Cacatua tenuirostris) is a very interesting bird species because up until very recently, they were very rare. As a fun fact, many Australian birds are exceptionally good at replicating human voices but the Long billed Corella is apparently the best of the best at that particular trait. That species of bird are now being bred, kept as pets, and occasionally released. And they live for as long as a long lived human too! From a purely practical perspective, what this means for me, is that I’ll have to be reasonably careful in the future with the sort of impressive oaths that occasionally may be heard issuing from my mouth as those birds may replicate those impressive oaths many decades into the future! The animal action this week wasn’t all about the birds, because this week the dreaded BONE WARS took place. Sometimes, nice actions on my part can rapidly turn into total disasters and such was the case this week with BONE WARS. The whole sorry saga began a few nights ago at the local grocery store which was selling giant beef bones for the purposes of making beef stock. I spotted the giant beef bones and thought that my canine friends here would enjoy sharing one of those giant beef bones. Sharing is clearly not in the canine vocabulary. Scritchy the boss dog kicked every other dog off the giant beef bone and spent several delightful hours in the sun gnawing away at the choicest bits. Scritchy was having a good day! And then the bone was passed downwards along the pecking order with each dog having a turn at the giant beef bone. Oh happy day for the fluffy collective of canines! And so the day progressed. It was in the dark hours of the night when the forces of darkness wax and civility is not to be found. At about 3am, I awoke to the sounds of two dogs fighting over the now much diminished, but still precious beef bone. The beef bone was extracted and removed completely from the whirling dervish of teeth that was Poopy and Toothy. They are now both injured from their tussle, but slowly recovering. 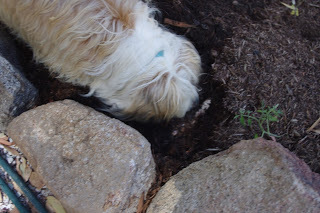 Fortunately the following day, the genteel Sir Scruffy – who would never be involved in such base behaviour – and who is most definitely aligned to the forces of the light-side, solved the entire dilemma for the two ragamuffins by burying the massive beef bone (possibly for later consumption) in one of the garden beds. Oh yeah, it has been quite hot here this past week. 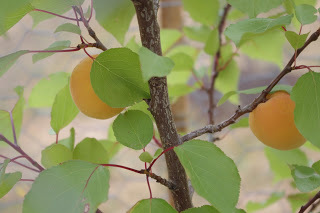 As part of preparations for dealing with the realities of the hot summer, I have been busily removing any and all plant competition from around the base of each of the 300 fruit trees. 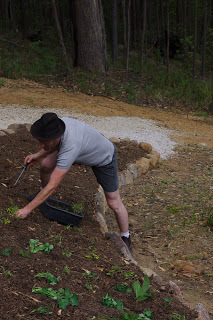 Once that removal of plant competition has taken place for each fruit tree, I then feed each fruit tree individually with approximately a third of a wheelbarrow of mushroom compost. 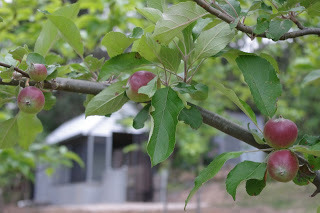 It is also a good time to inspect each fruit tree and take any further action that is required such as pruning root stock or dead branches etc. 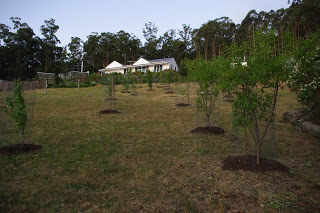 The entire orchard requires about 5 cubic metres (6.5 cubic yards) of compost and the entire job takes about 5 days and so far I have undertaken 3 of those days. 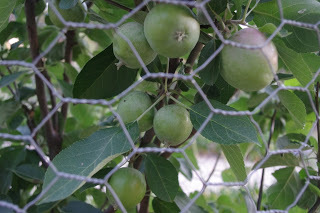 Other than that task and the occasional minor watering before an extended heat wave, orchards are very low maintenance. As I was wandering through the orchard, I noticed that a small patch of blue corn flowers had expanded its range over the past few years. 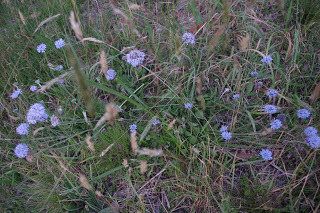 They are very beautiful flowers and I take their presence on such a hot year as a good sign because according to historical accounts the grasslands here were originally reported by early settlers to be a riot of various flowers. 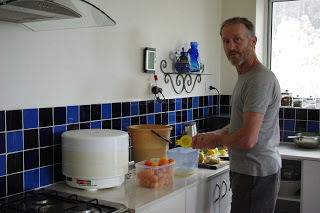 The food dehydrating process last week didn’t quite finish until about 3am and the lesson to take from that whole process is that it would have been far wiser to start the dehydrating process much earlier in the morning! 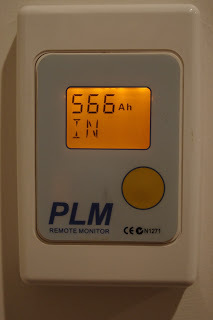 On the other hand, the solar power system produced a phenomenal and record amount of energy that day and produced just under 16kWh (566Ah x 28V) and the batteries were still 100% full by 4.30pm! 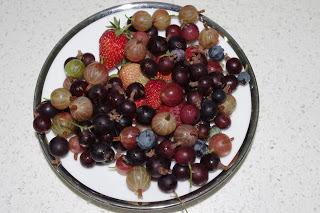 To bring some summer cheer into the readers of this blog in the wintery Northern hemisphere of this planet, I thought it would be a good idea to show a photo of some of the many and varied fruits that have ended up in my breakfast over the past week! Enjoy! Unfortunately, all of that fruit is many weeks early this year due to the heat, so I’m really unsure what will be in my breakfast fruit as the season gets even hotter. There was quite a lot of discussion about sugar maple trees in the comments section of the blog last week, so I chucked in a photo of the tree this week (it is in the foreground of the photo). Observant readers will note the Japanese maple in the middle of the photo. You really know it is an early hot season when the tomato plants have produced their first flowers this early. 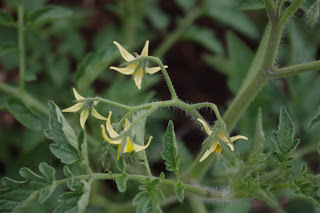 I have also noted the blue banded and also the bumble bees lurking around the flower beds so pollination of the tomato flowers is almost guaranteed! 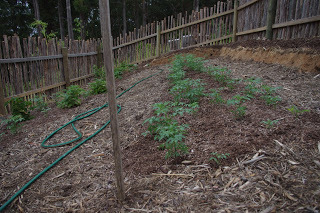 And Tomato Cam ™ tells no lies as the early summer heat is making the tomato plants almost bounce out of the ground! The temperature outside now at about 10.00pm is 11.8’C degrees Celsius (53.2’F). So far this year there has been 698.2mm (27.5 inches) of rainfall which is up from last week’s total 694.0mm (27.3 inches). Every summer, the tall trees drop dry, dead and yellow leaves when the hot winds from the centre of this largely arid continent blow through their branches. And this happens every year. During those hot windy days it is hard to spend time outside as the sun is oppressive. On some summer nights that hot wind continues to blow and it feels as if the continent itself were exhaling all of that unwanted heat in one huge long breath directly over this forest. This past year has been notable because following on from the coldest winter in 26 years, the months of October and December both produced record breaking heatwaves for this corner of the continent. An observant person may suggest that the weather extremes are becoming more extreme. And with that heat come the bushfires. 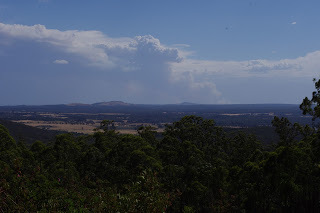 On Saturday afternoon, I could see from this eagles eyrie, a huge column of smoke which was the Scotsburn bush fire. Fortunately, the kangaroos soon settled their differences and went back to eating. It is not just the Kangaroos that are distressed by the extreme heat. 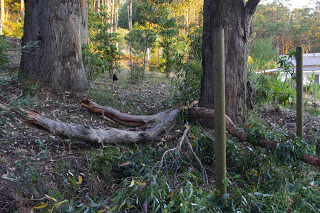 On Sunday I spotted two koala bears roaming around the forest early in the morning. It is a remarkable thing to see one Koala bear in a month, let alone two in one morning. Clearly they had to leave the shade of their tall favourite trees to travel down to the creek for a drink of water. 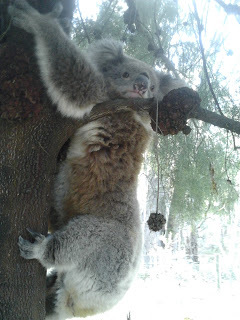 I found one of those Koala’s ambling across the road at their glacial Koala-like pace, so I gave the koala a bit of assistance crossing the dangerous (for them) road and motivated him to climb up into a very shady Cherry Ballart tree (which is a native fruit tree). A couple of hours later I went back to check on him and he was still happily asleep in the shade of that tree. He had moved on by the early evening. The bee hives are both kept in the afternoon shade which helps keep them cooler than if they were positioned in the full sun. 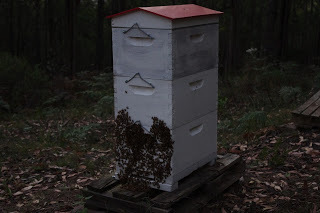 It is interesting to note that placing hives in the full sun is often the advice given by bee books – but that advice is inappropriate in an area subject to this sort of extreme weather. 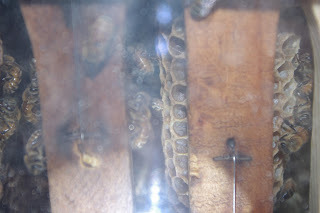 Despite being in the shade, the air temperature was still over 40’C (104’F) and the bees were clinging to the outside of the hive enjoying a bit of fresh air. 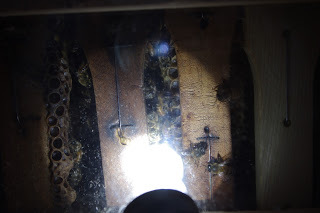 The other bee hive, which is the new experimental bee hive, has far less bees than the older better established hive, so they weren’t as stressed by the heat. But as you can see with Bee Cam ™ they were still very active on those hot days. Adaption to the weather is my motto and after a few days the heat becomes the “new normal”. 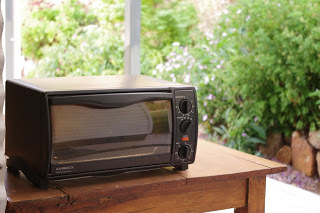 Adaption doesn’t mean giving up my homemade bread loaves and so I simply placed the solar powered electric oven outside in the shade which works a treat! Hmmm, freshly baked bread without heating up the kitchen! 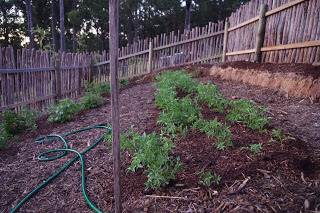 Adaption also involves watering the tomatoes, vegetables and berries at night. I have very limited water supplies and watering at night allows the water to percolate into the soil without being lost to evaporation. 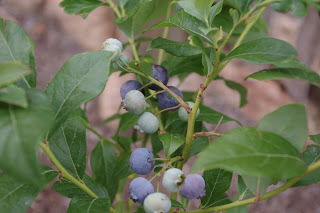 Some of the younger fruit trees in the orchard that were struggling received the occasional half bucket of water, but most of the 300 fruit trees simply struggled through and some of the older and more advanced trees showed no signs of heat stress at all. 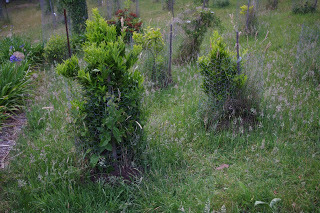 In hot weather, the young nut trees struggle the most of all and a couple of hazelnut trees and one of the pecan nut trees died over the past week. Observant readers will note the two kangaroos in the background placidly munching away. Some of the wildlife readily adapts to hot weather and I spotted this Southern Brown Tree frog who spends all day in the cool damp gully trap. 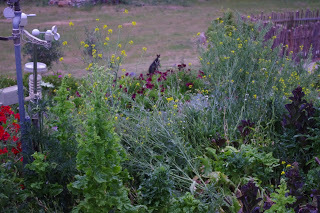 The frog then leaves the gully trap in the evening to enjoy some choice insects from the garden, before returning to the gully trap again as the dawn sky starts to light up. 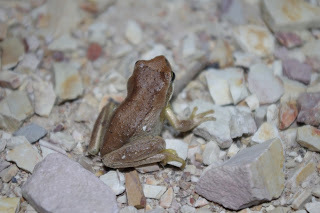 I found another frog – who is clearly something more of a daredevil than the one above – living in the drain for the chickens water within the chicken enclosure. I only found the frog when I accidentally disturbed it and it began making a noise like a squeezed rubber duck toy. Fortunately the frog was whisked away to safety (by me) before the chickens could eat it! That frog leads a precarious lifestyle but benefits by also enjoying access to regular water when many of its friends in the forest don’t. 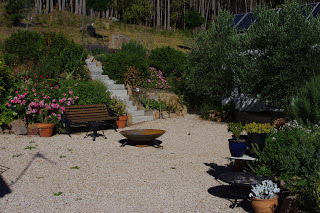 And speaking of precarious lifestyles, for the benefit of the readers of this blog I went outside into the scorching afternoon sun with the camera during the heatwave and took a few photos to show you how the garden responds. 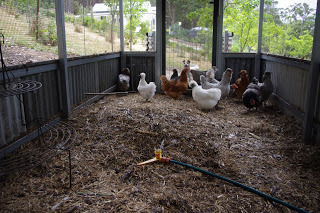 This week’s heatwave gave me incentive to consider the plight of the chickens if a bushfire were to occur here. 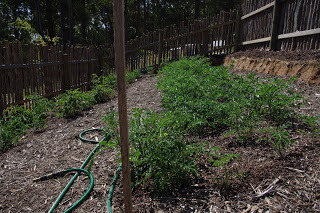 Despite the heat, I added a small gravity fed sprinkler which can sit on top of the chickens deep litter mulch and keep the area damp. 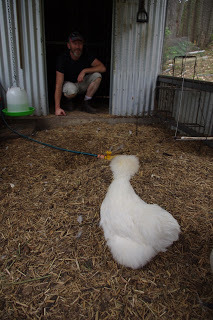 The chickens are less than impressed with this sprinkler! I also constructed a steel swing for them to play with and they seem even less impressed by that. The swing can be adjusted, so over the next few months I’ll keep adjusting the height until the birds start to use their toy. Observant readers may also be able to spot a very hot looking Scritchy who wants to assist the chickens learn to use the swing. 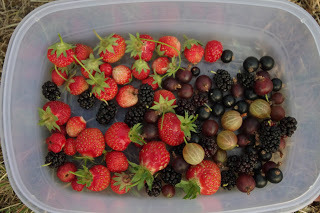 Berries are still plentiful, although the strawberries have now gone on strike and have stopped producing. 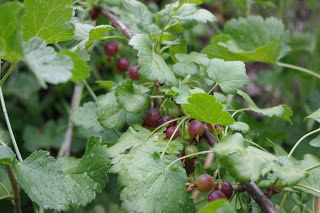 I’m unsure if this is due to the heatwave or it may be that the plants themselves which are in their third year have now stopped producing fruit? The future strawberry project which will hopefully be completed before next spring should have the strawberries grouped according to age. 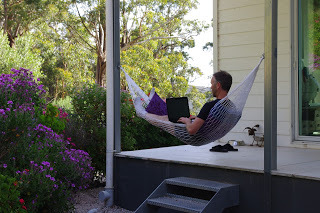 Finally yesterday afternoon the cool change swept through and the editor and I sat out in the brief rainfall with cooling winds and enjoyed a coffee. The temperature outside now at about 2.30pm is an enjoyable, overcast and very cool 18.8’C degrees Celsius (65.8’F). So far this year there has been 702.8mm (27.7 inches) of rainfall which is up from last week’s total 698.2mm (27.5 inches). 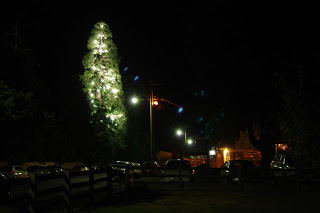 Christmas is a confused time Down Under. The realities of the hot summer climate just don’t seem to match the traditional Christmas imagery. On the other hand, I do have a very soft side for the completely outrageous displays of Christmas lights. Yes I know, it’s complex! 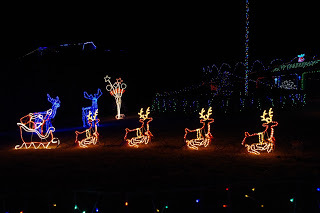 As a general observation of that traditional Christmas imagery, I would have to suggest that the reindeer would probably have dropped dead of heat stroke in the 35’C (95’F) temperatures on Christmas day this year. Certainly Santa would have been very hot in the heavy red suit. There have also been reports that one of the reindeer has a very red nose, which may suggest some sort of heat stroke! 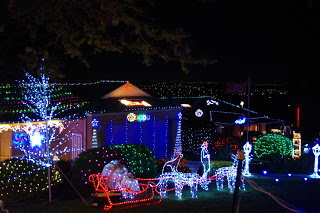 In the above photo of Christmas lights, which incidentally also incorporate city views, you can see that Santa has abandoned the sleigh – possibly due to heat exhaustion – leaving a few presents in the sleigh. Santa suffering from heat exhaustion is a very likely possibility because both October and December have produced record breaking heat waves in this corner of the planet. With Santa missing in action, the reindeer have sensibly commenced having a bit of a feed and you can see two of them cropping the grass. Not that there is much fresh green grass available for the reindeer because regular readers would know that in the past 14 weeks only 123.6mm (just under 5 inches) of rain has fallen in this area. It is instructive to see in the photo above that a kangaroo and emu – both of whom are wearing Christmas hats – are looking at the reindeer and perhaps are offering a helping hand? Or they may be conspiring to steal the presents in the sleigh? I’m not quite sure of their intentions. 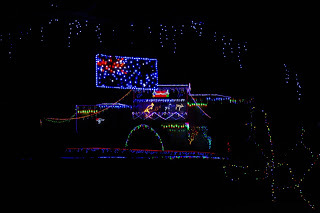 Another house continued the theme of kangaroos chasing off the reindeer – or perhaps the lights were some sort of dream sequence where the kangaroos were chasing deer off my apple trees, but yet again I’m not quite sure? Maybe, the reindeer had discovered the kangaroos nefarious intentions to steal the Christmas presents in Santa’s sleigh and decided to flee off into the night? Who knows what it all means, but wow does it look good or what? Pay up or the penguin cops it! 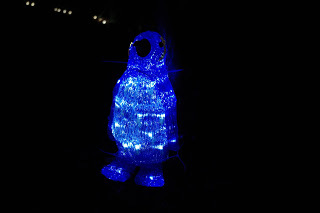 The award for the most confused Christmas light display of them all goes to this poor penguin who appears to have been cable tied to a small tree and looks like a hostage. Every time I thought about that poor penguin a voice popped into my head saying – imagine a 1920’s US gangster accent – Pay up or the penguin cops it! Christmas day this year was very hot and very windy. I enjoyed Christmas day with friends who live in a giant greenhouse which is about the size of an aircraft hangar. Without doubt, it was the most enjoyable Christmas day ever because after a heavy meal of excellent turkey and ham, they brought out masses of water balloons and pelted everyone. Within minutes everyone metamorphosed from sluggish and sleepy consumers of a heavy meal and good wines to rabid warriors seeking only to settle various scores. 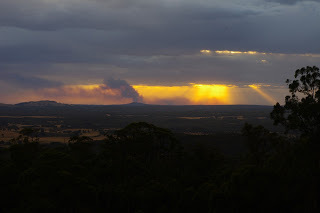 That Otway Ranges fire is still not out and it is expected to burn for the entire summer. 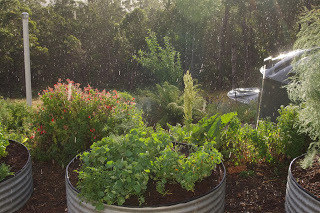 Back to this south eastern corner and as the Christmas day wore on into Boxing day, the tail of that huge tropical low reached all the way from the northern side of this continent and brought with it 35mm (1.37 inches) of rainfall. The air cooled and the water tanks refilled to about 90% full. And I could breathe a sigh of relief as the rainfall was a brief reprieve from this incredibly hot summer. 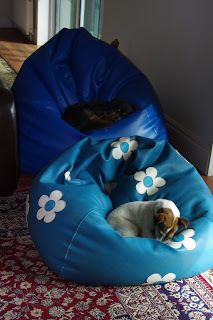 It wasn’t just me breathing a sigh of relief though, as the conditions changed from scorching hot to freezing cold and wet in only a matter of hours, and the dogs decided that the cold conditions were sub fluffy optimal and spent some hours dozing in peace. The cooler weather conditions are a perfect time to preserve the summer harvest. The stove top bottling (canning) hot water bath produces a huge amount of heat inside the house as it runs for hours. 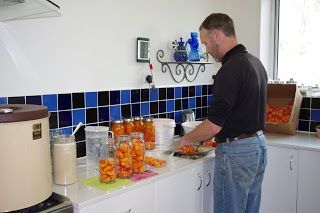 In the photo below I am busily cutting apricots – which I purchased as seconds from an organic orchard – and after a few hours of cutting, half a year’s supply of apricot fruit had been preserved. On cold winters mornings, six months from now I’ll hopefully be enjoying that fruit. I wasn’t the only one feeling heat stressed this week. A very large tree next to the old chicken run and shed decided to drop a huge limb onto that area. The scary thing was that I was planning to work in that area on that particular day, but the heat forced me back inside the house. I’m also glad that the chickens are no longer underneath such a large tree. On a more positive note, it was nice of that tree to provide me with some additional firewood which I harvested! Over the past couple of days I have started converting the old chicken shed, where that large branch fell, into a brand new fire wood shed. 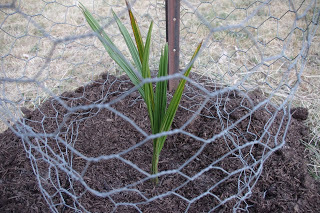 As part of that project, I wanted to salvage the materials in the old chicken run. 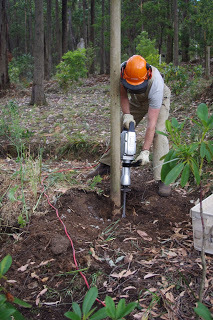 That meant recovering the treated pine poles (which I have a future use for) from the structural grade cement holding them into the ground. 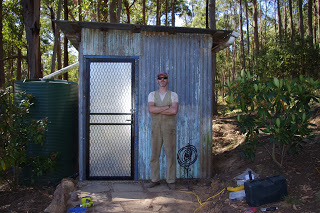 After almost a day with the electric (solar powered) jackhammer, I was regretting using such heavy duty structural grade concrete (edit – Chris is an over-engineering enthusiast). Eventually after much labour all of the treated pine poles were recovered. All of the steel cladding on that side of the old shed was removed and many of the gaps were filled . Observant readers will note that the steel corrugated cladding now extends to meet the steel roof of that shed. 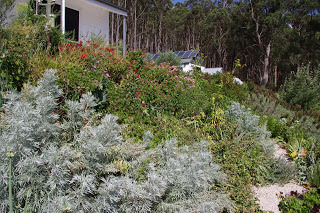 In removing the old steel corrugated cladding I upset many huge huntsman spiders (edit – google images of them if you dare) who were only too happy to let me know exactly how annoyed they were with this new project. 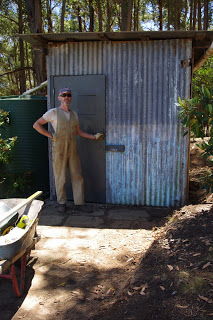 Tomorrow, I’m planning on completing the re-cladding of the outside of that shed and may even get a chance to commence the internal steel lining. Not every night over summer is a hot, scorching and windy experience. Some nights it can be quite cool to cold and the air is so still that you can hear Boo Bok Owls calling to each other with their distinctive calls, meanwhile the bats are zipping around overhead catching huge moths which are attracted to any and all lights. It is on those nights that the editor and I will sit in the courtyard (and sometimes with visitors), talk rubbish and toast ourselves in front of the coals of the brazier. The old brazier was a dodgy construction of thin sheet metal which was clearly in for a good time but not a long time. So the other day I was picking up a supply of manure at the local sand and soil supplier and spotted these beautifully manufactured heavy duty steel fire braziers. The story was that a local company that produces tanker trucks (with rounded ends) realised that they could use their pressing machines to produce really heavy duty fire braziers and so they have started constructing and supplying them. I knew that I was looking at outstanding bit of engineering and so I did a once in a decade spontaneous purchase and the editor and I have been enjoying the new brazier ever since. It sure beats watching television! 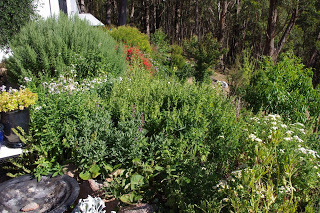 From the right hand side to the left hand side an observant person may spot the following flowers: Feverfew; Lemon Balm; Sage; Soap Wort; Yarrow; Geraniums; and Evening Primrose. I haven’t enjoyed the heat, but the insects certainly have and there is greater diversity in the number and type of insects that arrive here every single year. 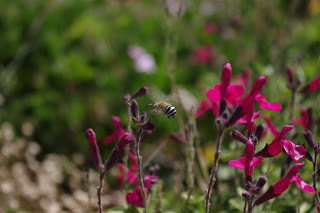 Today, I spotted this Blue Banded Bee (which is a native bee I believe) on a Salvia flower. The temperature outside now at about 9.00pm is an enjoyable, overcast and very cool 13.6’C degrees Celsius (56.5’F). So far this year there has been 740.0mm (29.1 inches) of rainfall which is up from last week’s total 702.8mm (27.7 inches).